Much of the tenderness and juiciness of an oven-baked steak is mostly determined in the preparation for baking before it ever hits the oven. High quality steaks with plenty of fat marbling throughout will be more tender than leaner cuts. Tenderloin, rib-eye, T-bone, porterhouse, strip steaks and sirloin are good choices for baking. Success depends on choosing the right steak and preparing it for maximum tenderness. Dry brining enhances the natural tenderness and moisture content of a steak. First, rub your steak on all sides with kosher salt, sea salt or a salty rub recipe, then place it in a dish in the refrigerator for an hour or two before cooking. The salt draws moisture out of the steak at first, but over time the juices are reabsorbed, carrying the salt into the tissues. The salt tenderizes the meat and helps to hold the moisture in the tissues during cooking, making the steak more juicy. After the two hours, rinse the salt off the steak and pat it dry. Use dry brining on steaks when you do not plan to marinate them. A basic marinade contains acidic ingredients to tenderize the meat, oil to moisturize and herbs and spices for flavor. 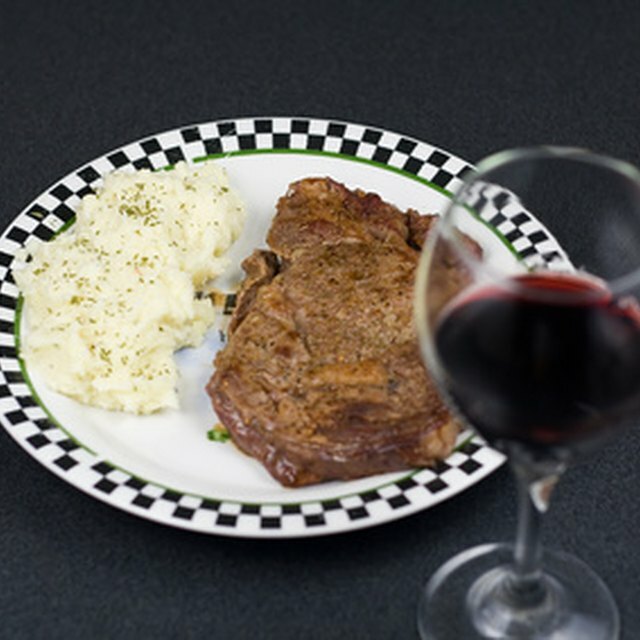 Acid ingredients like wine, vinegar and citrus juice break down the muscle and tendons of the steak to tenderize it. Using a marinade for a short time -- two hours for marinades containing citrus and up to four hours for others -- adds a lot of flavor. 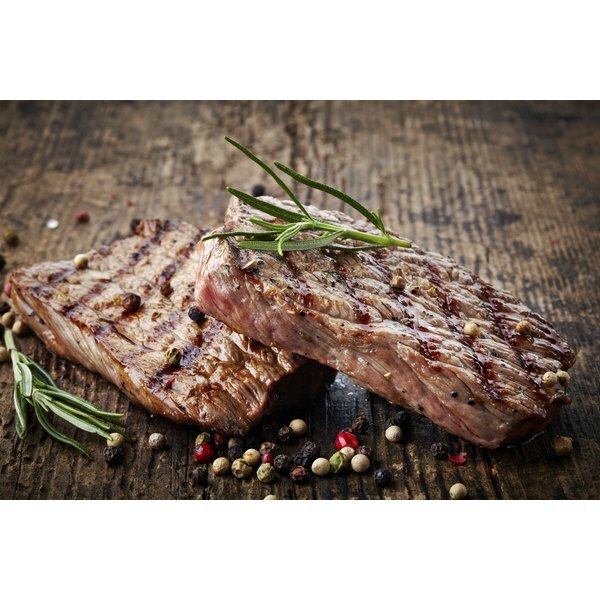 Longer marinating times break down the tissues too much, ruining the texture of the steak. Use about 1/2 cup of marinade for every pound of meat and keep the meat refrigerated. Drain the marinade and pat the steak dry with paper towels before cooking. It is important to sear the steak on both sides. This is not about sealing in juices; browning the steak caramelizes the surface and adds a lot of flavor, as well as a crusty texture. The best way to achieve a good sear is in a preheated iron skillet over medium-high heat. Get the pan hot enough to sizzle, add a thin film of oil and the seasoned steak. Sear it quickly, two to three minutes per side.Then move it to the oven. Place the steak into an oven preheated to 450 degrees Fahrenheit. Cook the steak until it is done to your preference, turning it once. The U.S. Department of Agriculture recommends cooking steaks to at least 145 F, or medium, for safety, but many people prefer their steaks less done. The meat toughens as it cooks, so a well-done steak will be tougher than a medium-rare steak. Let the meat rest for at least three minutes before slicing.